It is big news recently that coral reefs all over the world are under threat. From warming water temperatures to ocean acidification to over fishing, use of toxic sunscreen and uneducated tourist practices, humans have been directly responsible for in some cases the loss of up to 70% of some of the world’s most famous reefs, like the Great Barrier Reef in Australia. 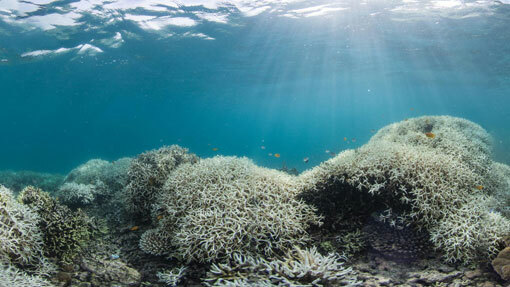 It will require great change in the future thinking of everyone on this planet to combat this unprecedented damage to corals, but the good news is there is one simple thing that you can do today, right now, to help combat the global destruction of coral reef and the help protect one of the earth’s most important resources. That’s right; the simplest and easiest way anyone reading this article right now can help in the global battle to protect our reefs is to pick up the closest sun cream or sunscreen bottle to you. It could be in your handbag, your back pack or you could be already wearing it. 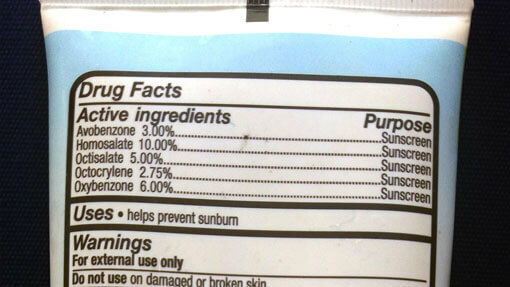 Check the label, if your sunscreen follows international regulations for the labeling of sun care products it will have a section at the very top that says “Active Ingredients”, looks something like this. If your sunscreen does not have this area clearly marked, more than likely you bought it while on holiday in a country with less strict regulations and you will need to look closely in the ingredients list for any of the following chemicals. If you have not guessed already, each one of those chemicals listed above is highly toxic to corals. Many of those chemicals are now banned outright in places which have a tourism industry dependent on Coral Reef tourism or scuba diving, like Hawaii, Mexico and The Great Barrier Reef. Those tourism areas will ask that you only use reef safe sunscreen, if your sun cream isn’t natural, they will not let you use it. Why Are These Chemicals Bad For Coral Reefs? Without getting too much into the science of why these chemicals are bad for the reefs, let’s talk about what these chemicals actually do in sun creams and sun care products. Oxybenzone and other ‘benzophones’, absorb sunlight, or in other words, they help protect you against UVA or UVB radiation from our sun. This prevents you from getting sun burnt and potentially was thought to help protect you against cancer as well. The main problem stems from the fact that as these chemicals absorb the suns radiation. Then you as a person absorb these chemicals through your skin. At some point these charged up chemicals want to get rid of the radiation they absorbed, like a sponge releasing water once you stop using it. Now that these sun cream chemicals meant to protect you, are past your most effective barrier, your skin, they persist inside our bodies acting like little mini microwaves to all of our cells. Most human cells have absolutely zero protection against UVA or UVB radiation which is why you can’t stare at the sun without permanently damaging your sight. Any of your cells damaged in this way are now potentially cancerous cells, and hopefully we don’t have to explain why that is bad. Yeah But What About Coral Reefs? 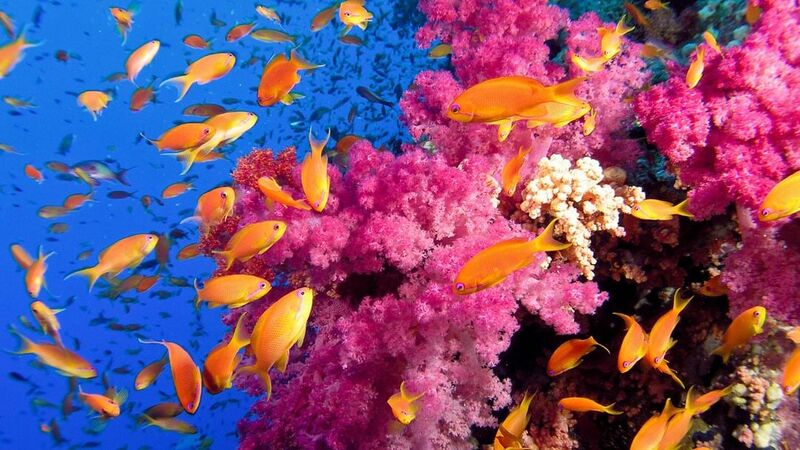 Coral reefs are also made up of very sensitive organisms which also have cells. Coral reefs are born from microscopic Polyps that attach to rocks and other debris in the ocean, once attached they begin to grow a calcium skeleton for protection. That skeleton is what we mostly see as coral reef and it requires a lot of energy for the coral to grow. Most of that energy is provided to the coral by living Algae in the coral tissues. If a coral polyp eats anything containing, or is in an environment saturated with sunscreen chemicals like Oxybenzone or Octinoxate, the algae in the coral is damaged, the coral polyp ejects that algae and loses the ability to grow. 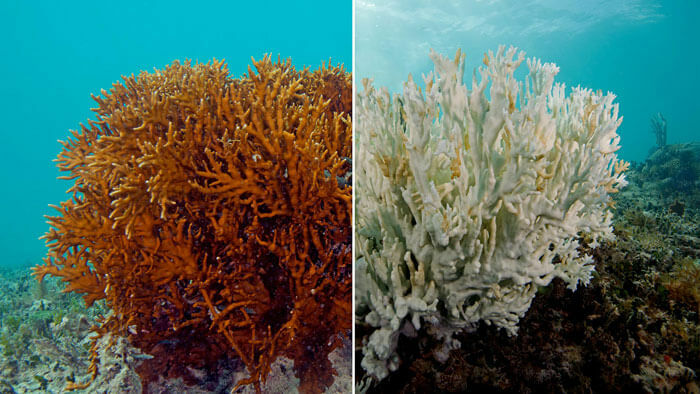 This effect is also known as coral bleaching, also be caused by warming waters. To put it simply anytime the coral feels sick, has damaged algae or it is basically too hot, it does what humans do and tries to get rid of the problem, like when we drink bacteria ridden water or our body temperature increases beyond a certain point. This leads to the death of the coral polyp and likely the rest of the colony. This is rarely isolated to a single coral and usually affects large parts of a reef all at once. Seriously, My Sunscreen Kills Coral Reefs? Yes, sadly your most effective weapon against sun burn on your tropical holiday is essentially one of the most devastatingly nasty factors our coral reefs have to try to contend with every day we scuba dive, snorkel or swim around them. What Can I Do As A Scuba Diver? To protect yourself and coral reefs, there is a super easy solution to the problem of chemicals sunscreens entering the environment. There are some great non chemical, all natural and 100% reef safe sun cream available for anyone entering the water around coral reefs. The best part is that, now natural sunscreen here in Thailand does not cost any more the regular stuff and potentially protects you even better, because instead of absorbing radiation, natural sun creams reflect UVA / UVB radiation. That means no cancer for you and no death to corals, hard to pass that up as a scuba diver. 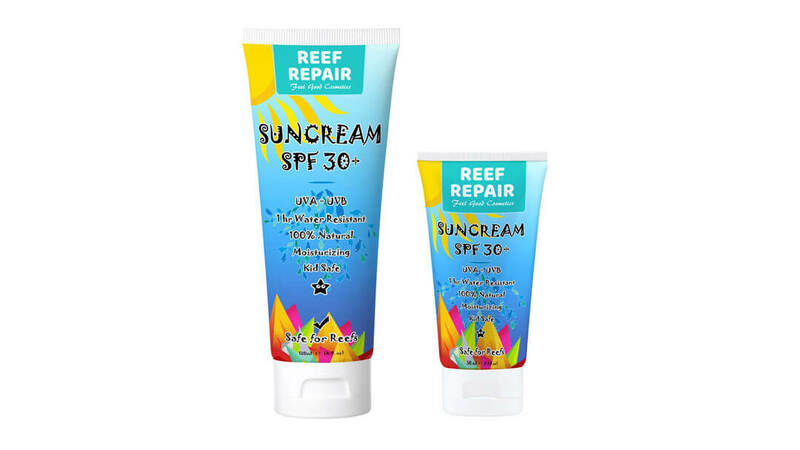 While it is still currently legal to use toxic sunscreen here in Thailand at Kiwidiver we now stock Reef Repair all natural sun creams and sun care products for your convenience. We encourage you to help us to help the local environment on which our world depends while protecting yourself with a healthier and natural alternative to toxic chemical based sunscreen. These revolutionary sun creams will protect you from the sun, moisturize your skin, are water resistant and best of all help ensure the safety and survival of the coral reefs we will be diving on here in Phuket. You can also help us spread the word about the dangers to our oceans and our bodies caused by the toxic chemicals in some sunscreens by sharing this post with your friends and encouraging them to purchase more healthy alternatives like Reef Repair Sun Cream. So you don’t just need to do the PADI Coral Reef Conservation specialty to help the reef while you are diving here in Thailand. Whether you are learning to dive or joining us for technical or rebreather training you too can help the reef and help yourself. 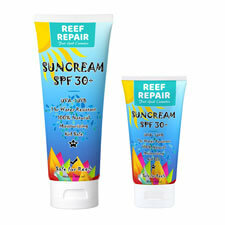 While Reef Repair Sun Screen typically dosnt cost any more than the brands that contain toxic chemicals Kiwidiver pledge to donate all profits from the sale of Reef Repair Sun cream this year to Project Aware another great marine environmental organization. So by replacing your bad sun protection with good sun protection you help yourself and you help the environment.